Assam Petro-chemicals Ltd. 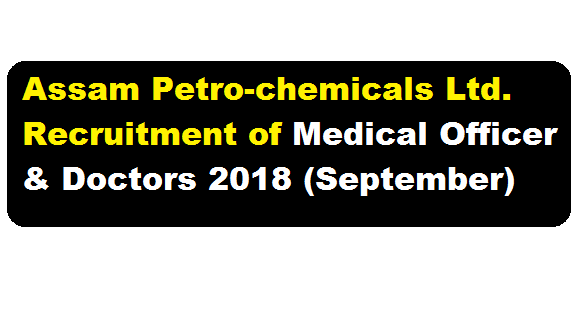 Recruitment of Medical Officer & Doctors 2018 (September) :- Assam Petro-chemicals Ltd. has issued two separate recruitment notification in the month of September 2018. In this post we will mention only about the Recruitment of Medical Officer & Doctors in Assam Petro-chemicals Ltd. If you want to check second recruitment of Assam Petro-chemicals Ltd. then you may refer to this link. According to the Assam Petro-chemicals Limited Recruitment 2018 for Medical Officer & Doctors , Assam Petro-chemicals Ltd. invites applications for the following posts. Essential Qualification : MBBS degree from a recognized University with Registration Certificate from State/Indian Medical Council. Preference shall be given to the candidates possessing higher qualification. Essential Experience : Minimum 02 (Two) years post qualification experience in Govt. Health Centre/ Nursing Homes. Retired Doctor bearing good health can also apply for the post. Essential Qualification : MD in respective discipline from a recognized University with Registration Certificate from State/Indian Medical Council. Essential Experience : Minimum 01 (Two) years post qualification experience in Govt. Health Centre/ Nursing Homes. Retired Doctor bearing good health can also apply for the post. 1. Candidate should have registration as per IMC ACT-1956 with Registration from State / Indian Medical Council. 2. Relaxation in experiences may be considered for the deserving candidates at the sole discretion of management. 3. Reservation for specified categories shall be followed as per Government norms. 4. The Management also reserves the right to recruit or not to recruit in any of the above positions or cancel the process at any point of time without assigning any reason whatsoever. 5. Selected candidates will not have any right whatsoever to claim for regular absorption by virtue of working on contractual basis. 6. Candidature of the candidate is liable to be rejected at any stage of the recruitment process or after recruitment or joining, if any information provided by the candidate is found to be false or is not found in conformity with eligibility criteria mentioned in the advertisement. i. Application duly filled and completed should be sent by ordinary/speed post or courier services with detailed bio-data in prescribed format available in Website with 04 (Four) PP size coloured photograph along with self attested copies of certificates/testimonials in support of qualification, age, experience, caste etc. within 30 (thirty) days from the date of publication of this advertisement. 8. The candidates working in Govt. / Semi Govt. / PSUs shall either forward their application through proper channel or shall produce NOC from their present employer at the time of interview. In case the application of the candidate is not forwarded through proper channel or the candidate fails to produce NOC from his present employer at the time of interview, his/her candidature will not be considered. 9. The prescribed qualification/experience is the minimum and mere possession of the same does not entitle a candidate for interview. APL’s decision shall be final in this regard. 10. Any canvassing directly or indirectly by the applicant will disqualify his/her candidature. Any dispute with regard to recruitment against this advertisement will be settled within the jurisdiction of Dibrugarh Court only. 12. Place of work: Company’s Hospital, Namrup. 14. The candidates called for interview shall be reimbursed to & fro II tier AC train/bus fare from the mailing address) by shortest route subject to production of original or photocopy of ticket(s).